While researching this book, Glenn Schweitzer met four Moscow physicists who were trying to license Russian technology to western firms for product manufacture. During the worst times, they were reduced to driving taxis to keep things afloat. He asked them, will technological innovation have a discernible impact on the Russian economy in the coming decade? No, was the immediate reply. Are they right? In Swords into Market Shares, Schweitzer examines the roots of such pessimism and the prospects for Russia to prosper from its technology in the post-Soviet world. He explores the different visions of prosperity held by entrepreneurs, technologists, and government officials and goes on to examine the barriers to progress as Russia struggles to build a viable technology industry on its own terms. In accessible language, this book talks about technology's place within Russia's economy and its research and development infrastructure. Schweitzer looks at the impact of the Soviet legacy central planning, lack of priorities, scant incentives for personal initiative and the aftermath of the Russian financial meltdown of 1998. He also reviews the experiences of American companies that have invested in Russian technology and examines the results of pressure to reform according to the economic model of the West. Schweitzer goes on to document the problems of economic crime and government corruption, which plague activities designed to generate income in Russia. He discusses the lack of protection for intellectual property and taxation issues that stand in the way of technological innovation. The book looks at the impact of the "brain drain" as Russian experts seek greener pastures not only the ominous recruitment of Russian biological weapons experts and the acquisition of military technology by "rogue" nations but also Russia's own program to sell military technology for badly needed funds. Schweitzer's use of case studies and examples puts a human face on these issues. He also discusses Russia's 60 "science cities" sites of state research centers with close-ups of three "nuclear cities." Can the technical strengths of the Soviet military complex find a place in civilian Russia? How can this vast country sustain even a minimal standard of living? 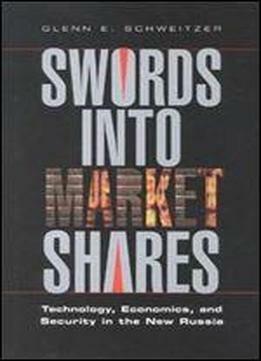 Swords into Market Shares addresses these and other key questions and explores fundamental policy issues confronting both Russia and the United States as Russia struggles for an economic foothold.